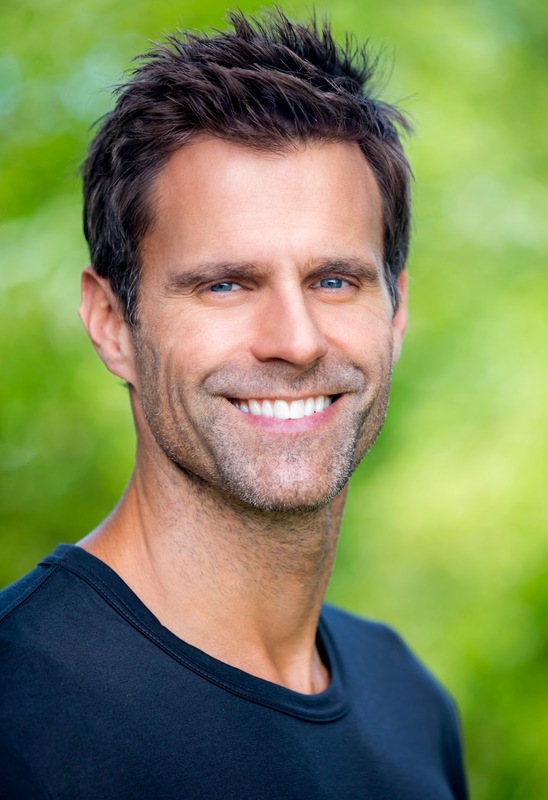 Cameron Mathison has been one busy guy since his “All My Children” days. He’s the go-to host/correspondent for all the big talk shows; he danced his way almost to the semifinals with Edyta Sliwinska during the fifth season of “Dancing With the Stars”; and he’s guest-starred and starred on numerous TV shows and movies. Cameron’s current gig is that of an undercover nanny. On Oct. 12 at 9/8c on Hallmark Movies and Mysteries Channel (formerly the Hallmark Movie Channel), Cameron stars in “Along Came a Nanny” as Det. Mike Logan, who must go undercover as a nanny in a formerly safe suburban neighborhood to find out who is burglarizing the houses. Celebrity Extra: What was it about the film, and the character of Mike, that appealed to you? Cameron Mathison: The comedic aspect was a really big factor. It was one of the first things that hooked me. I also really like that he was this big kid who hadn’t grown up, and he has to take care of other kids. He’s not really taken that seriously at work, but he wants to make a serious change as far as progressing in his job. He wants to move up. In order to do that he has to step it up. It was a moment in his life where he knew he had to take that step into responsibility and learn to deal with kids. I've lived through that phase myself, and I can really relate to it. CE: While it was a feel-good movie, it was very believable and didn’t come off as pat or saccharine. CM: Good! I’m glad it came off like that, because that can be a challenge. These movies get shot really quickly. We don’t have a lot of luxuries as far as time goes. To me, it’s important in my life, in general, to be happy and to be a benefit to those around me. We all got along really well. I try to be happy; I try to make the set happy. Sometimes it’s challenging when things are stressed, but with that said, this was a feel-good set. We were just having a lot of fun, a lot of laughs, and there was a lot of silliness. It was probably one of my favorite jobs that I can remember doing. It was a lot of fun. CE: How was your leading lady, Sarah Lancaster, to work with? CM: She’s the best. She’s such a pro and so fun and so down-to-earth and genuine. It’s maybe a little intimidating knowing that she’s a big deal. I went in making sure I was as prepared as I could be so that I could just really relax and be spontaneous and listen and react and play off her. Right off the bat she was so sweet and kind and funny — she has a great sense of humor. CE: This movie had a very “Castle” feel to it. I could see it being a semi-regular series for the channel. CM: I’m a big fan of “Castle,” so I love that comparison. Let’s see … how do we make this into a series? I guess we have to keep on changing his name and undercover occupation, because I don’t think he could be a nanny in every episode. But if I were, that would be fun. I know that Hallmark loves their mysteries, and I love working for them, so let’s hope for more! CE: What would you like people to come away with after watching this movie? CM: That’s a good question. First, I want them to have fun watching it, because there’s lots of comedy in it. I want them to feel warm, because there’s love and there’s growth within the characters through the story. I’d like for them to be entertained by the comedy, warm from the love, and also surprised by the mystery. Those are the three biggies that I would like people to take away. CE: I know you’re in Vancouver now filming a show. What is it? CM: It’s called “Game of Homes,” and I’m hosting it. It’s a really fun renovation/reality show where they’re taking four dilapidated houses off their foundations, and moving these four houses to a really cool downtown location. The contestants make up four teams, and they each end up, through a series of events, getting a specific house. Every week they renovate a new room of the house and the aspect of the house. And every week there is a new challenge with prizes. You can win a trip to Paris or a week cruise in the Caribbean. The ultimate goal, if you win, is that you win your house and a piece of land to put it on. It’s a fun show, because it’s reality show-esque: You get to vicariously live with them; they sleep and live in their houses, even though they are being renovated. The stakes are super-high. Another other aspect about it that I really like is that I graduated with an engineering degree like 700 years ago, and my dream was always to go into a design firm with my best friend, who’s an architect. I was going to be the engineer, and he was going to be the architect. That was always my dream. And then I bailed on him and went in the entertainment world. But since that time, this is the closest gig I’ve ever had that involves design, construction, engineering, load-bearing walls, header beams — all that kind of stuff. For me it’s kind of coming close to my original dream of what I wanted to do with my life. CE: Do you know when it airs, and when we’ll get to see it? CM: It’s a Canadian production. Initially, it’s going to air in Canada. But I have a feeling it’s going to appear elsewhere; it’s just one of those shows. I’ll definitely let you know when I know what channel it’s going to be on in the States. Awesome interview with Cameron! It was such a fun read. He would be great in more Hallmark mystery movies! Hope Hallmark feels the same!